ICE is working to evolve both the American Right and the American Left. This page describes our efforts to help foster evolution on the conservative/libertarian side of politics. In July 2016, ICE convened a high-level invitational conclave of political, business, and social leaders to discuss the future of the American Right and how responsible conservatives and libertarians can help shape the rebirth of Republican politics. The gathering included distinguished author Charles Murray, Republican gay rights activist Margaret Hoover, and anti-tax icon Grover Norquist. Brief biographical profiles of the participants in ICE’s 2016 Austin Conclave on the Future of the Right can be seen as this link: http://www.culturalevolution.org/austin-conclave-2016 The event was sponsored by the Democracy Fund philanthropy. 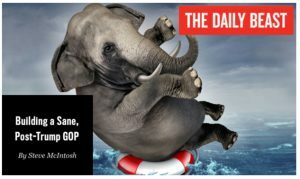 Following the Conclave, ICE president Steve McIntosh published an Op-Ed in The Daily Beast summarizing the event and calling for a more evolved form of Republican politics. This invitational gathering of 30 conservative and libertarian thought leaders and activists was held last year in Austin Texas. The Conclave’s approach involved reducing polarization within the Republican party itself by better integrating core traditional values within a fiscally conservative yet socially progressive framework. 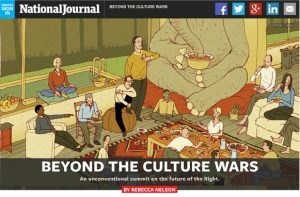 The Future Right Conclave received national press coverage in the Washington-based centrist publication, The National Journal. Read the article entitled, Beyond the Culture Wars an Unconventional Summit on the Future of the Right. Recorded on December 3, 2014, this caucus call teleconference explores a vision of the “Future of the Right.” The recording features our esteemed panelists Steven Hayward, Rich Tafel, and Michael Zimmerman, together with your hosts Steve McIntosh and Carter Phipps. This was the second in our series of teleconference caucuses on the future of American politics. Our inaugural caucus on the “Future of the Left,” from October 25th, is also available as an audio recording at this link. ICE is neither Left, nor Right, nor centrist, so these teleconferences on the Left and the Right do not express the views of our think tank by themselves. But if we are going to help evolve politics, we need to focus on improving both sides of the spectrum. As explained in our recent white paper, Depolarizing the American Mind, the political polarity of Left and Right is relatively permanent and existential, continuing to reappear in new form as society changes and evolves. Our approach accordingly seeks to anticipate the future state of these existential political positions by describing the form that the “Future Left” and “Future Right” will likely take in the decades ahead.